Order a 1 year subscription to Weight Watchers magazine for only $3.99 (up to 4 years) with code MONEYSAVING at checkout. This offer expires tonight (April 26, 2012) at midnight EST. This magazine can also be a great source of unique coupons from time to time. 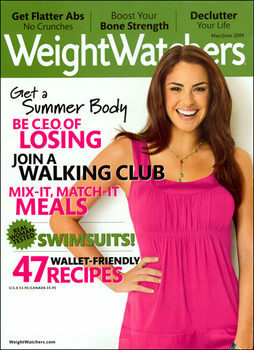 About Weight Watchers: Weight Watchers Magazine is the perfect companion for women or men who are dedicated to their health and fitness goals. Issues of Weight Watchers provide great quick-recipe ideas, seven-day menu plans, exercise tips, and other great health and lifestyle advice that can help the reader stay on track. Weight Watchers Magazine brings many inspirational stories from Weight Watchers members that will be sure to keep motivation high. Whether already enrolled in a weight loss program or simply trying to maintain current fitness, Weight Watchers is a valuable tool for success. I normally don’t mess with magazines. But my MIL loves the Weight Watchers mag and I realized I could use this as her Mother’s Day gift. Thanks it worked great. Thanks Crystal, I snagged this one up because 1. )It’s a great magazine and one issue is more than that price and 2.) They accept PayPal! 🙂 Yay!